Several people have mentioned Leverick Bay Marina because it’s not ridiculously costly and because they have a pool. We decide it might be a good place to be for Christmas. On Sunday, we realize it’s cheaper to rent a car than take a taxi. Driving is on the opposite side of the road here; we head down the edge of a steep hill that looks like it heads straight down into the water. 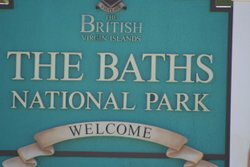 We drive to a church (great music) and then to The Baths, one of the must-see items on Virgin Gorda. 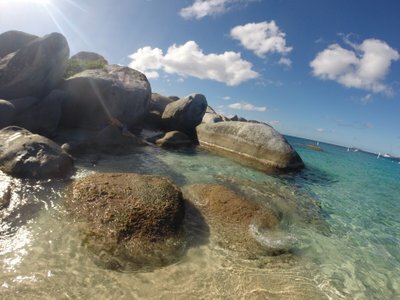 They are huge granite boulders created from cooling molten rock that sometimes captured giant air bubbles. 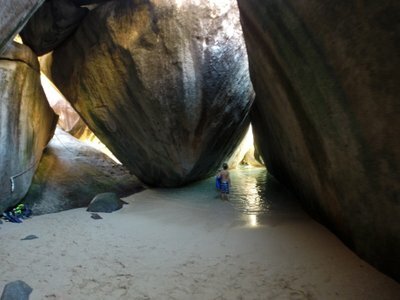 There is gorgeous white sand and lots of hidden pools as you wind your way through the boulders to get to Devil’s Bay where you can snorkel along them. Come see them – it is worth the visit. On Monday morning we decide this is not the place for Christmas and that we’ll go somewhere else (although we are not sure where). I tell Matt I want to do laundry first and, while there, I meet a Canadian on a catamaran vacationing with his wife and four children. He asks about us and I give him the short version of our story. “Well, you’re outside of the norm, aren’t you?” he asks. The thing is, neither Matt nor I consider ourselves that way. If anything, I’d say we are solidly in the norm and actively looking forward to rejoining our tribe in Cleveland. This trip was simply a detour. Matt joins me and we end up having a long conversation with him and his wife. They are both lovely and fun. They invite us to lunch and we continue our conversation. This brief connection makes the holidays seem much brighter. They are also heading out and invite us to join them on a different island but we still have boat projects that need attention. 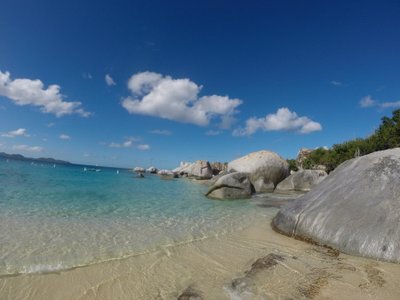 We finally find a marina with a pump out and head there, Virgin Gorda Yacht Harbor. We still don’t know where we’ll be for Christmas – Matt says he feels like Joseph and Mary trying to find a place to have the baby. 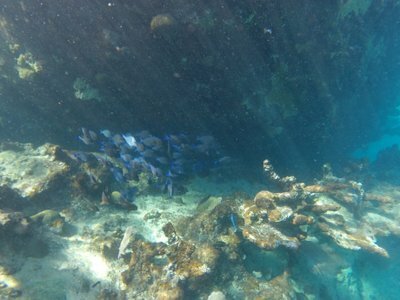 This entry was posted in Uncategorized on December 31, 2014 by Diane.